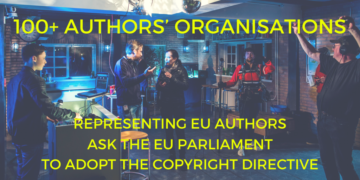 The undersigned organisations of authors – representing hundreds of thousands of voters who are writers, screenwriters, filmmakers, composers and songwriters – urge you to seize this once in a decade opportunity and support the successful adoption of the Copyright Directive. Since the last European elections, the European Commission, the European Parliament and Member States concluded that the European Union needed to modernise copyright in the Digital Age. Included in this debate was a conviction of the need to strengthen Europe’s authors by addressing the systemic weak bargaining position in negotiating contracts, and promoting fair remuneration. Authors are at the very origin of the copyright value chain for Europe’s cultural and creative industries, which produce EUR 509 billion in value added to GDP, provide 7.5 % of the EU’s work force and significantly contribute to the EU economy in terms of employment, investment, growth, innovation and competitiveness on a global scale. Yet for the vast majority of authors, their careers are barely sustainable and poorly remunerated. The Parliament has played a decisive role in insisting that the Copyright Directive address this anomaly and has significantly improved the various provisions in the Directive which will benefit authors, and which we have supported. Throwing the Directive away now would not only reverse the European Parliament’s work to support authors but also be an unprecedented setback for all creators in Europe. Abandoning the Directive now would be a major victory for the major international players who ignore the damage caused to the creative industries by their dominant position and refuse the harmonisation and inclusion of basic standards of transparency and fairness in EU copyright legislation. This Directive concerns the future of Europe’s cultures. The European Parliament played a key role in the negotiations ensuring future generations’ access to freedom of expression. Please – adopt the Directive and send a strong signal to the future generations who want to write, compose, create so that they can be fairly remunerated. Full list of of signatories here attached.